I won this device in a contest hosted on the e-cigarette-forum. As such, I am not in any way invested in the device and my review remains unbiased, as usual. Your mileage may vary. Since acquiring this device, I have run it through its paces thoroughly with a lot of tanks, a lot of wires (both using coil heads and RBAs/RTAs), and a couple RDAs. I have used the Temperature Control mode with all three standard wire types and have adjusted the TCR for my 430 SS. If after reading through, or watching the vid, you decide that this device is a must-have, you can find it from $$50 up all over the place. 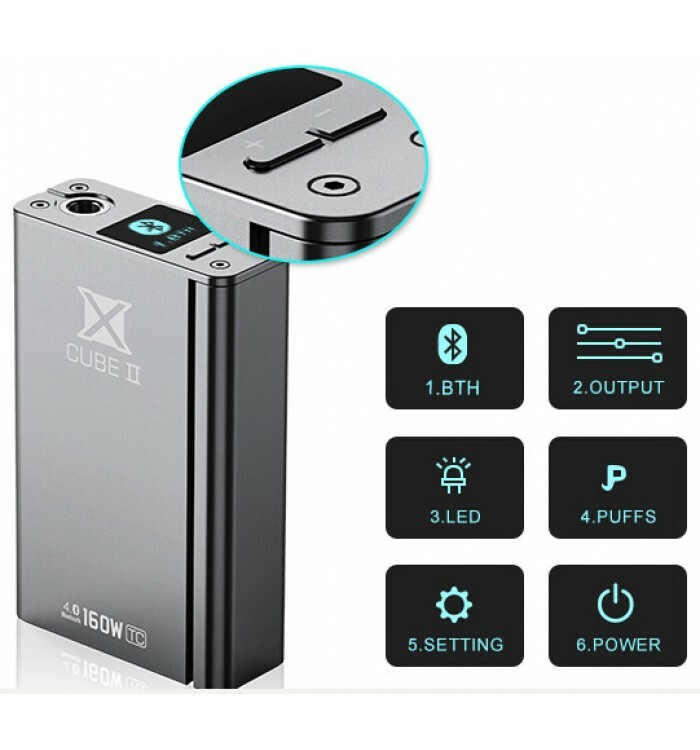 The first thing you'll notice about the SMOK XCube II is its size. It is large. Perhaps substantial might be a better word. Of course, if you're coming from a hammond box, it might seem a little smaller. Otherwise, it's huge! The device measures 24.5 x 100 x 60 mm. It's also quite heavy, especially when two 18650 batteries are installed. The size is needed to house a pair of 18650 batteries, an outsize firing switch, an LED bar in the switch, a USB port (for upgrading and not charging), a decent screen, and the chip. Ah, the chip... Seems SMOK learned a lesson from the poor attempt it made at Temperature Control with the SMOK XPro M80 Plus. The new chip will support Temperature Control over Nickel, Titanium, Stainless Steel, and just about any other wire thrown at it through the use of TCR adjustments. A far cry from the Nickel only, cotton burning XPro M80 Plus. 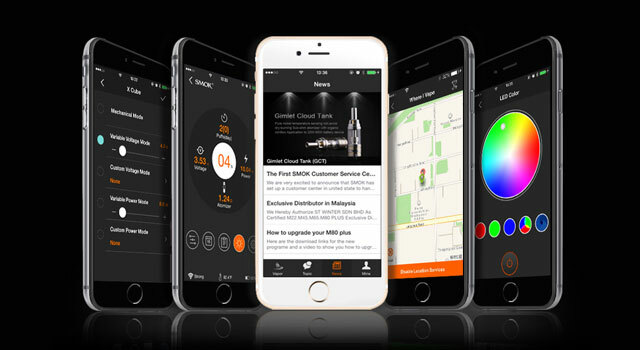 Further, it supports Bluetooth so many of the features can be accessed through a compatible Android or Apple powered smartphone. 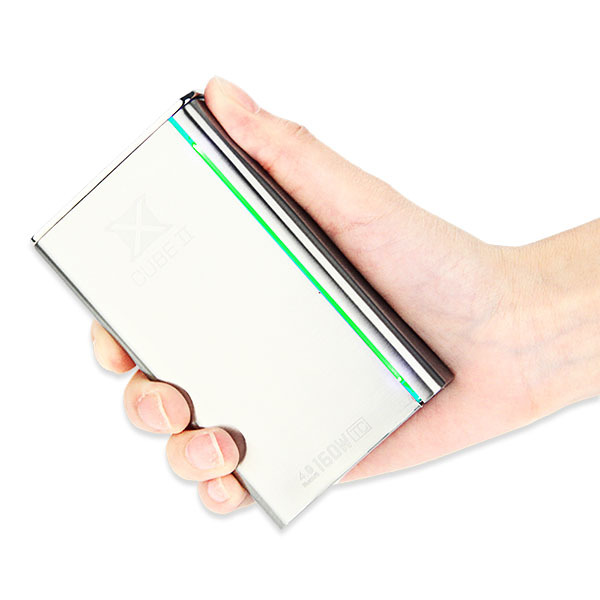 This device also allows for firmware updates, and has received several since its release. It's not all good news, however. In order to use the Bluetooth features, there's that "compatible" issue. The App, Smart BEC (which, sadly, stands for Bluetooth E-Cigarette), will only run on an Android with V4.1, or iOS V6 and Bluetooth Version 4. Older phones, Windows phones, Blackberry (does anyone even carry these anymore?) need not apply. Apparently, even if you can get it installed on the phone, it's still not all golden. On both the Apple Store and the Google Play Store the app is getting less than rave reviews. Me? I'm running it fine on my Samsung Galaxy Note 4. And, those wonderful temperature control settings? Nickel settings came pre-installed. If Titanium or Stainless Steel Temperature Control was desired, the phone needed to be connected with the device and registered, and then the upgrade could be purchased. It wasn't even (on the Android side) an upgrade that could be purchased through the Play Store. I had to use a credit card to purchase the additional roughly $3 worth of software. I wrote that in past tense as I see that SMOK's website now claims that all Temperature Control settings are free, and those that upgraded before are eligible for a $5 coupon (if they place an order with SMOK, on SMOK's website, before March 31, 2016). Whoop! OK, seriously, to upgrade this unit’s firmware, you have to first download the tool, then the firmware file from SMOKtech’s website - I’ll put the links in the description below. Launch the software. while the program is running, remove the batteries. Press the fire switch and keep it pressed. At no point in the upgrade process can you release the firing bar. Plug in the device, and click “connect.” Once connected, click “Do Upgrade.” Theoretically, you're finished... Some people run the upgrade through a few times to be certain. I did not have to. After the upgrade cycle is completed, click "Disconnect." There may be an error displayed, but SMOK claims that this is normal. To check your current version, turn the device off, then back on normally. The welcome screen will display your version number. As of this review, the current version is 1.093. The screen on this device is in a unique position. It's on top of the mod where, when adjusted right, the information can be seen WHILE firing. No mirrors, no potential dry fires watching the screen while firing, and no whiplash trying to get it back in front before the screen changes. And it's big enough that most of the information on display is easily readable. The only issue I have with the screen is also its position. I am afraid of over dripping or breaking a tank or leaking into the screen and top-mounted buttons. Yes, top-mounted buttons... Next to the screen, opposite the 510, are the conveniently labelled + and - buttons that assist with menu navigation and wattage or temperature adjustment. Five clicks of the fire bar to power on from an off state. Pressing one of the buttons (I don't know if it's up or down because of the screen flip issue, but on mine, it's the + button) and the fire button changes the mods mode from Wattage to Memory to Temp and back to Wattage. Pressing the other button (on mine it is the - button) and the fire bar changes the hit profile from Normal to Hard to Max to Min to Soft and back to Norm. Pressing the + and - buttons simultaneously turns Bluetooth on or off. Three clicks of the fire bar to enter the menu. There are 16 memory slots. For each slot, the wattage can be adjusted after selection. The fourth option is Puffs. Options include setting number of allowed puffs from max, and 1 to 999, viewing puffs already taken, and resetting the puffs counter. Many reviewers do not like that feature, but I could see it useful for a person needing to reduce or track their vaping habits for medical reasons. Set the date and time (which isn't displayed anywhere that I can find, but is used in conjunction with the Smart BEC app), in the format YEAR/MO/DA 24:00. The sixth option is Power. The only settings here are off and on. Each of the menu items can be selected by pressing the up or down button, then clicking the fire bar, or quickly clicking the firing bar quickly to scroll through the items, then long pressing to select an item. As I look back through what I've written, it looks as though I do not like this mod. That's not right. I like this mod. I like it a lot. What I've written above are just annoying niggles... scratches on the surface. Deep down, it's a different story. 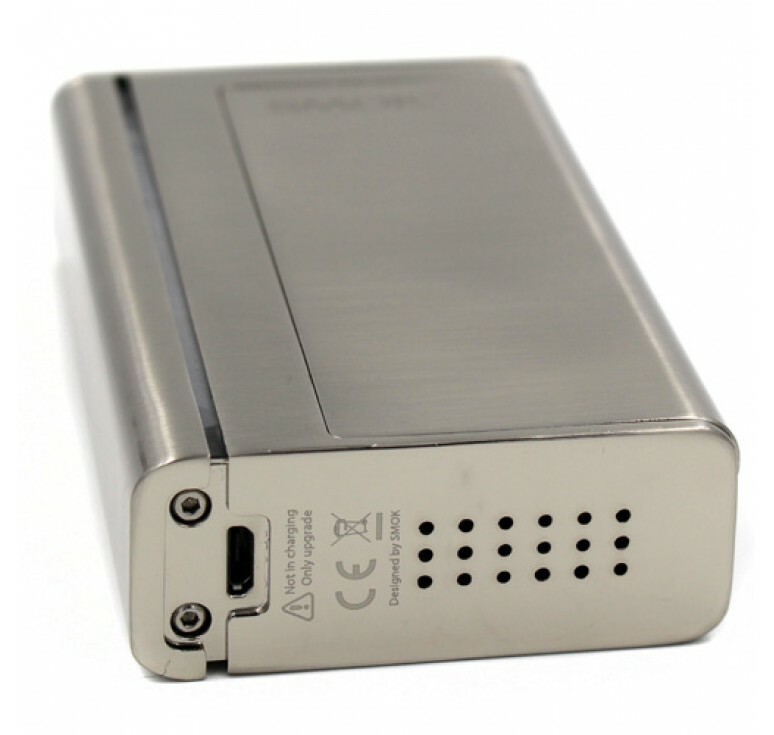 For starters, the usage of dual 18650 high drain batteries provides for high wattage and loooong battery life. I typically get around two solid days of vaping with the mod set to around 50 watts. 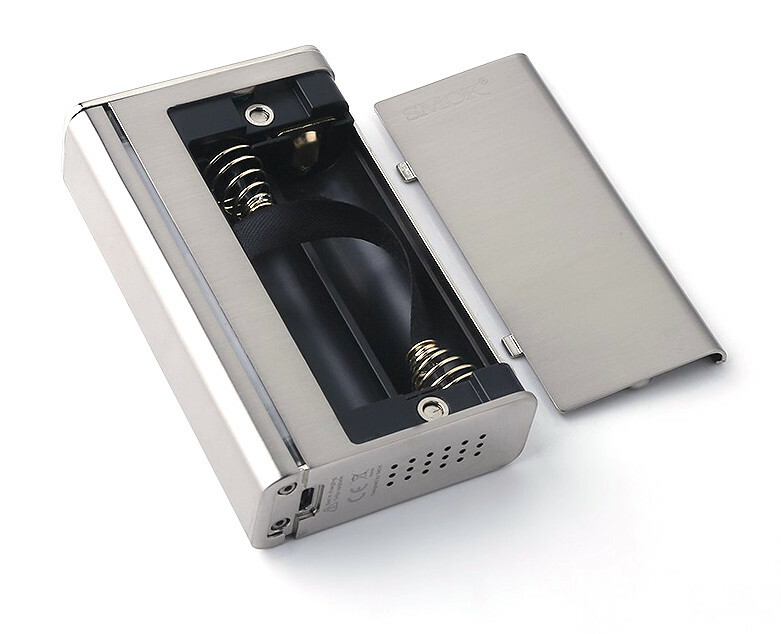 I'm also pleased to see that SMOK provided plenty of ventilation on the bottom of the mod. I assume that the venting is for both batteries and chip. I am also quite fond of the TCR adjustment which allows for the use of any wire - except that the wire will be called either TC-NI or TC-TI or TC-SS. This means that NiFe30 can be used by setting the TCR of any of the Temperature Control wire settings to 0.0032. Stainless Steel has several different grades, and the TC-SS can be adjusted for each grade. I prefer 430 Stainless Steel with a TCR of 0.00138. 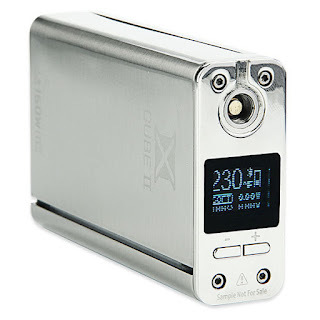 The TCR adjustments on the SMOK XCube II are recorded to five decimal places. The firing bar is a geeky blessing, an ergonomic dream, and a curse. Blessing in that the LED bar under the firing bar can display just about every visible color in a couple different patterns. This makes this mod an attention getter. Of course, getting attention is not always wanted. Yes, the LED can be turned off, but that's a hassle to do each time the locale of vaping might change. A dream in that the bar can easily be depressed by any finger, group of fingers, or thumb in nearly any grip that can be imagined. Curse in that putting this mod in a pocket is a bad idea unless it's locked first because the bar is so easy to depress. Some have reported that the button is either hard to press or sticking. Others have reported an easy fix in loosening the two hex screws at the top of the mod by about 1/4 turn. The battery door is easy enough to take off and will not fall off on its own, but I find I often absentmindedly play with it when I'm vaping. It can be a little distracting. Distracting, but not loose. In fact, there are no rattles on the device anywhere. Inside the device, there's a clean battery sled with no visible glue, precious little visible (but shielded) wire, massive springs, and relatively easy to see orientation moldings for + and -. Those massive springs do a fine job at holding the batteries in place, but are a little ugly when compared to some other battery sleds. They can also snag a battery wrapper if care is not taken when removing the batteries. Depress, and take out the positive end first. 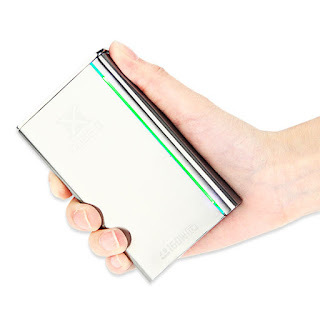 Nice design, fit, and finish with comfortable, rounded edges, and no rattle. Temperature control over a wide range of wires built in and through TCR adjustments. Power up to 180 watts (after update). Spring loaded 510 with Stainless Steel Threads. Ergonomic design with large, easy to press firing bar. Eye-catching LED bar under firing button. Bluetooth enabled with an Android or iPhone app. Compatibility issues with the app, and lack of support for alternative systems. Up until now, a charge to add additional TC methods. Inability to rename wires in TC mode. Finish - 9.5/10 - There are no unnecessary seams, sharp edges, or crunchy threads, and no button rattle. The missing half point is for the distracting, yet secure, battery cover. Form - 9/10 - Comfortable to hold. Great, large, easy to read screen. The firing bar is very nice, but the ease of use also subtracts a partial point as it is almost too easy to push. Another half point is taken off the top because of its (necessary) size and weight. 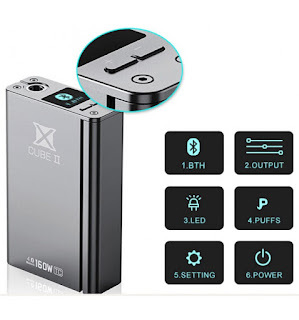 Function - 9/10 - This device fires quickly every time, and features a long list of fine tuning capabilities enabling a vaper to really dial in a good vape. The inability to alter the name of the wire, and the lack of onboard charging take off a point. Final - 9.2/10 - A grade! Would I replace this device if it were lost or stolen today? I don't know. When I first received it, the answer would have been a resounding yes. Today, there are a lot of options that are as good or better at around the same price. Would I recommend it to a person wanting an upgrade from their single 18650 or lower powered LiPo mod (think iStick 50 or the original Joyetech eVic VT)? You bet! Another fine review. You explain everything so well. 5 stars!